The Village Beacon Record, left two panels, and The Times of Huntington-Northport published this piece in print on Sept. 01, 2016. 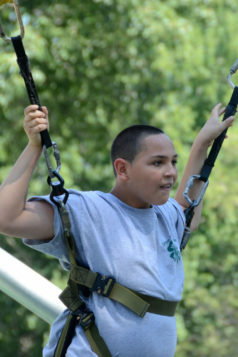 Melonie smiled as she watched her son Justin-Joseph, or J.J. for short, land several backflips on the trampolines at West Hills Day Camp in Huntington on Saturday. 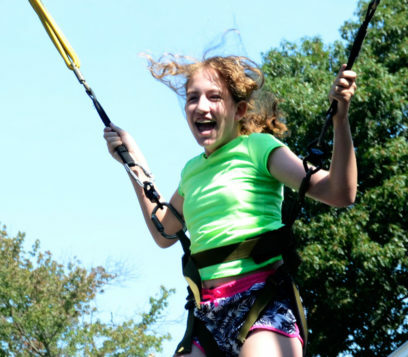 The activities at Suffolk Aspergers/Autism Support and Information’s first annual Family Fun Day — zip lines, face painting, sand art and a water slide, in addition to the trampoline park — were the perfect outlet for J.J.’s vast supply of energy. SASI, a not-for-profit support group that provides special needs families with helpful resources, provides that sense of community Melonie wants for J.J. Founded in the living room of co-founder Stephanie Mendelson on Dec. 4 of last year, SASI has grown from 12 parents to over 700 families throughout Suffolk County and across the rest of Long Island in eight months. Co-founder Priscilla Arena said Family Fun Day was meant to be an event for children on the autism spectrum to have carefree fun, and a way for families to bond. Mendelson and Arena, both from Mount Sinai, have children on the autism spectrum. They found there was a lack of resources on Long Island for families and formed SASI as a support group to fill that void. To its members, SASI provides information about available resources, advocacy, financial and emotional support. On the last Friday of every month, the group hosts speakers at John T. Mather Memorial Hospital in Port Jefferson — so far, families have heard from a representative from Parent to Parent, a state planning attorney, a Medicaid broker and a parent advocate for education. The group’s first speaker, special education advocate Danielle Brooks, was at Family Fun Day giving free advice to families. She said SASI is a special organization because it built a caring network for families in a short period of time. The event, she said, was a great opportunity for children to have fun in a safe environment. Justin-Joseph bravely tries a backflip on the trampolines at West Hill’s trampoline park. Photo by Rebecca Anzel. SASI also hosts a birthday party club for its member’s children, who range in ages from kids just shy of 3 years old to adults in their late 20s. Arena said children on the autism spectrum have difficulty making friends, so sometimes there are not many others to invite to a child’s birthday party. The group is also working on a lending library, which will help members borrow books donated to the organization; a job skills program; life coach program and blue pages resource handbook, which would help parents find services they need across the island. Legislator Sarah Anker (D-Mount Sinai) said she is “thrilled and excited” that Arena and Mendelson founded SASI. Instead of complaining about a lack of resources, she said, the SASI co-founders work hard to address issues. The group has also gained the attention of U.S. Rep. Lee Zeldin (R-Shirley), who is sponsoring a bill to ensure Americans with disabilities have access to necessary health-care equipment. Family Fun Day was held at West Hills Day Camp in Huntington, a facility famous for its autism-friendly Gersh Academy. The facility donated the space for the event, which Anker said had about 800 attendees. In addition to the attractions, the event also had refreshments from Crazy Crepes, Mr. Softee and Kona Ice. Families could purchase t-shirts or raffle tickets to win one of many donated baskets. For Melonie, Family Fun Day was the perfect way to spend time with her son. A girl smiles as she jumps on the trampolines at West Hill’s trampoline park on Aug. 27 at SASI’s Family Fun Day. Photo by Rebecca Anzel. 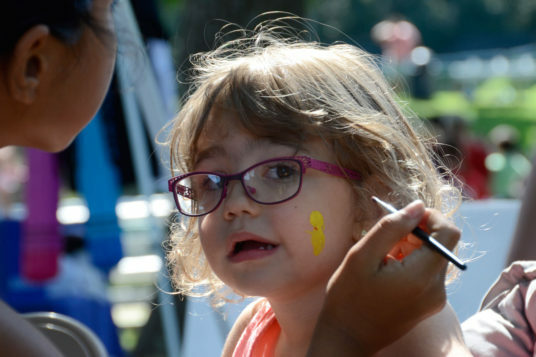 Two-year-old Hailey gets a bumble bee face paint at SASI’s first Family Fun Day on Aug. 27. Photo by Rebecca Anzel.